Update: Live photos are now in the gallery. The covers lifted on Mercedes-AMG’s new entry-level model last fall ahead of the Paris Motor Show. The delectable A35 hatchback caught our attention, and understandably so with its racy good looks and 302-horsepower (225-kilowatt) turbocharged four-pot. Sadly, the A35 was destined to be forbidden fruit for those of us in North America, or rather, that version of the compact Merc was. Today the A35 sedan is revealed, and this time us Americans get to play, too. As you might guess, the A35 Sedan is essentially everything you love from the hatchback, minus the hatch. It rides on the same all-wheel-drive underpinnings with a matching 107.4-inch wheelbase. At the rear, the sedan’s roof slopes downward to a short deck adorned with a subtle spoiler, beneath which exists enough space for an assortment of items that can fit through the A35’s 37.4-inch wide trunk opening. 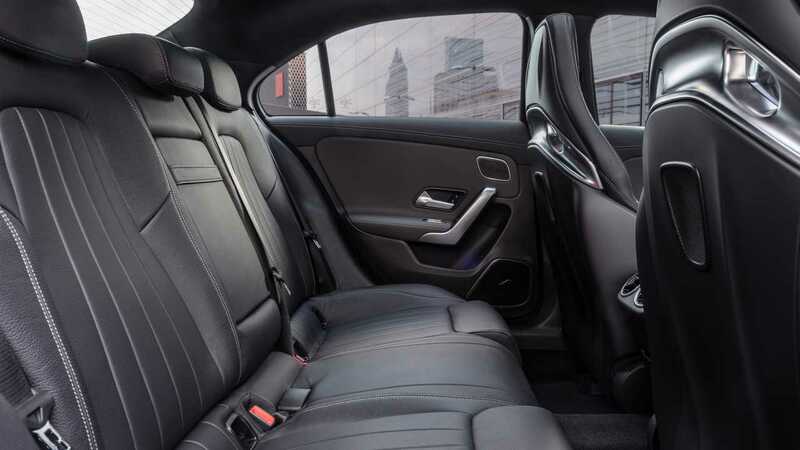 Mercedes-Benz doesn’t tell us exactly how much space is in there, but the automaker promises it’s enough to carry large luggage for an extended road trip. Moving inside the greenhouse, rear-seat passengers get 37.2 inches of headroom, which is fairly substantial for a compact sedan. The front-seat accommodations are exactly the same as those from the hatchback, including the flat-bottomed sport steering wheel and fully digital cockpit fitted with the latest MBUX infotainment gear. The AMG nature of the A35 is reflected in the five various driving modes selectable from the cockpit, not to mention the visual cues courtesy of a red/black interior color combo. As interesting as all that is, we suspect most A35 buyers will be interested in performance. The mechanicals are a carbon-copy from the hatchback, meaning you get the 302-hp turbo four connected to a seven-speed dual-clutch gearbox that can shift itself, or manually through wheel-mounted paddles. The A35’s 4Matic all-wheel-drive system sends all power to the front wheels by default, but can ultimately distribute half that power to the back for a 50/50 split. Individual braking at each wheel can help yaw the A35 through corners, while the adjustable suspension offers a range of settings for comfort or attacking race tracks. A 0-60 time of 4.7 seconds matches the hatchback, though Mercedes doesn’t have an official top speed published for the sedan just yet. Speaking of which, we don’t have pricing or availability on the new sedan either. 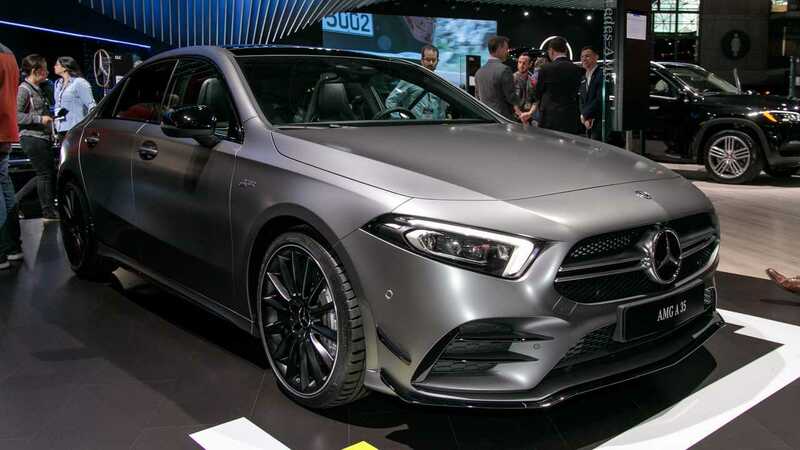 However, a Mercedes spokesperson did confirm with us that yes, the A35 sedan will be available in the States and it will be a 2020 model. Armed with that information, expect the new entry-level AMG to hit dealerships later this year. Affalterbach. The next level of driving performance is here: the new A 35 Sedan is the first choice for customers looking for the sportiness typical of Mercedes-AMG, combined with a comfortable amount of space and versatility for passengers and luggage. The exceptional driving dynamics of this agile sedan are ensured by the 2.0L four-cylinder turbo engine with 302 hp, the AMG SPEEDSHIFT DCT 7-Speed Transmission, the AMG suspension and the variable AMG Performance 4MATIC all-wheel drive. The new A 35 Sedan expands the current AMG model range by providing an additional attractive entry-level model. It appeals to young customers who are looking for a high level of performance along with a comfortable amount of space for passengers and luggage. An acceleration time of 4.7 seconds for 0-60 mph meets these customers' desire for performance driving dynamics in the compact car segment. "Following the very successful launch of the hatchback model, things are moving along dynamically in the compact class segment at AMG. Sport sedans are the origin of Mercedes-AMG and part of the brand's core. With our new A 35, we are transporting this history into modern times in the form of a very attractive model that serves as a point of entry into the world of AMG and also appeals to new customer groups," states Tobias Moers, CEO of Mercedes-AMG. The A 35 Sedan rides on a 107.4 in wheelbase and displays the proportions of a powerful yet compact vehicle, with sporty and short overhangs at the front and rear. The grille with twin louvers, the AMG front bumper with flics on the air intakes, a front splitter and silver chrome trim elements are distinguishing AMG design features on the A 35.
tailpipe trims firmly characterize the AMG design from the rear. 37.4 in. This allows comfortable loading and unloading, even of large luggage. motion of the foot under the rear bumper. even closer connection between the vehicle, driver and passengers. element emphasize the horizontal orientation of the interior design. The trailblazing voice control system activated with the words "Hey Mercedes"
light can be switched on and off without touch. manual transmission mode and optional adaptive damping. on the color LCD display directly integrated in the controller. settings quickly changed with one touch. reduce torsion and increase stiffness. weight where it matters most for driving dynamics. program selected, the sound is modulated from balanced to powerful. combined with fast shifting and optimum connections when upshifting. transmission mode "M" for manual gear shifting with the shift paddles. only to a 50:50 percent distribution to the front and rear axles. such as the response of the engine and transmission. driving, thanks to features such as economical early upshifts. function is available in the "Reduced" and "Moderate" drive settings. characteristics. The direct result is enhaced ride comfort and agility. silver-painted brake callipers feature unique black AMG lettering. they are currently faster or slower than their best time. the vehicle (acceleration, gyroscope, steering angle, wheel speeds). to 3D and can also be updated online. display, allowing the driver to improve lap times with a virtual instructor onboard. bumper and diffuser blade also have a high-gloss black finish. elements underscore the sporty and performance-focused vehicle character.